Disclaimer: This story has been free for years on Comixology so I'm posting the whole thing. Buddy, I don't think you understand the concept of Innocence. It works if you believe in " everybody gets one " morality. I mean... "Get the drop on the goddamn Batman without any particular skills or foreknowledge of where he's going to be," is certainly *a* plan. I'm just going to assume the reason we never heard from this guy again is that the Penguin or the Joker caught him staking out their hideout waiting for Batman. No need to inconvenience Penguin or Joker for this guy. He probably got shanked by one of the many random robbers in Gotham. Either that, or he had a Snickers, and lived a regular, apple pie life. I like to assume he shoots himself in the foot and feel off a building. You know how they say something like a dozen people a year will manage to kill themselves putting on their own socks..? He'll be the one who manages it just reaching for them. I just assume he tried various stakeouts and just... like, gave up, because Batman never showed or did but there was no shot or so on and after a few months it was winter and it *sucked*. Or he tried the stake out and nine hours later, as he was getting bored, he hears an unmistakable "Ahem" from behind him and turns to find all the Bat-kids sitting on the nearest gargoyle just... staring at him. At this point he decides that a career building orphanages in Latvia sounds like a REALLY good idea. In all fairness, the word that I would best use to describe him does begin with an "I" and end with a "T". No, he can't be It. Gotham is full up on murder clowns. "You'll gloat too! YOU'LL GLOAT TOO!" 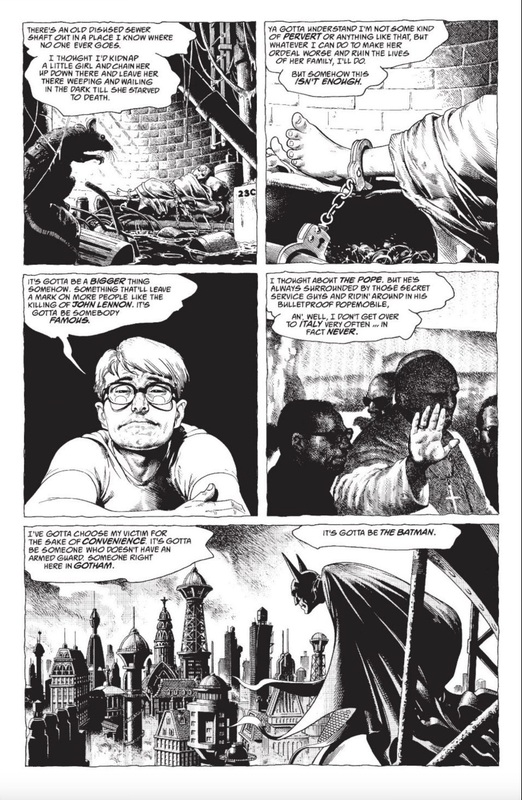 Given their similar appearances, I've often wondered if this story is what lead to making James Gordon, Jr. a "psychopath" (DC's words) and remorseless killer. I know this story came out in 1996, and I think Jimmy Jr was introduced in the late 1980s, but I only recall his malevolent side coming out in the mid- to late-2000s. 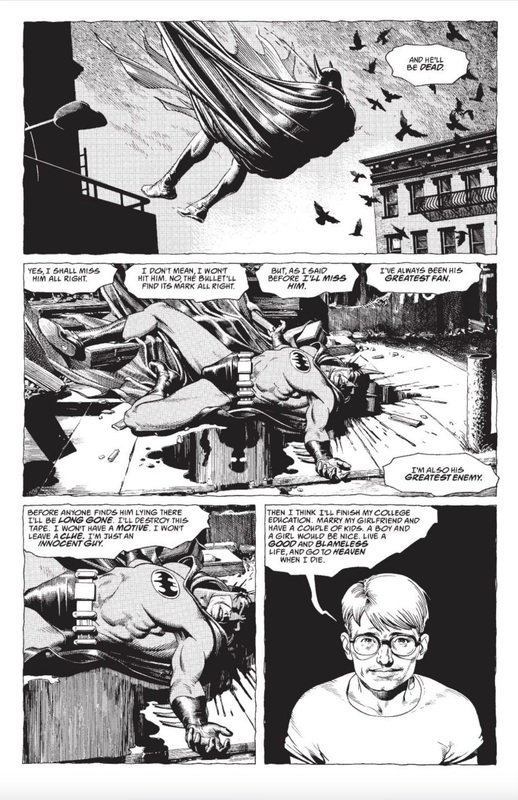 I love the Batman Black and White series, but this is one story I really don't understand. It's got very pretty art, but it has no real progression or ending. I'm not sure what it's supposed to be except a way of Bolland to showcase his art. 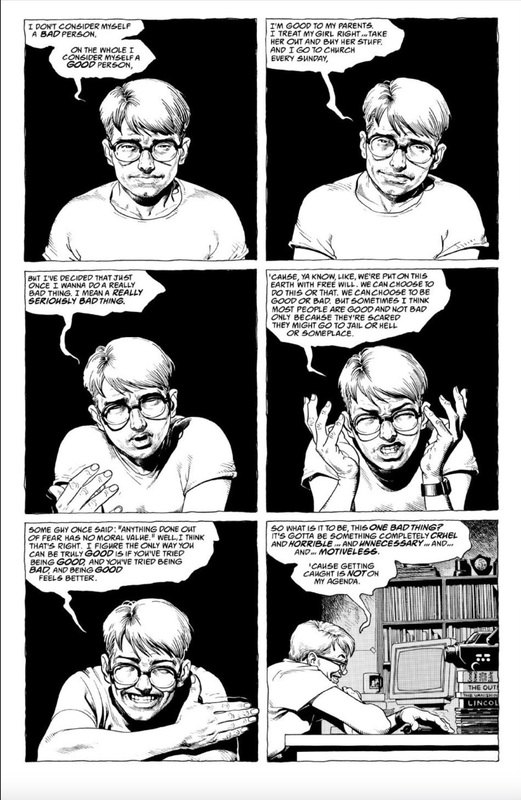 Having read this through Comixology, I thought for a while I had downloaded a preview of a larger story. 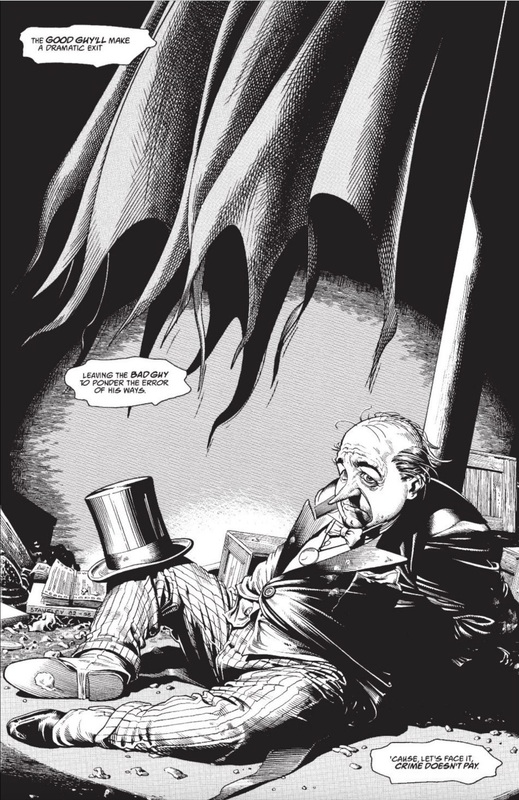 But it was reprinted in a version of The Killing Joke, so I guess this is the sum total of the tale. I'm not saying it's bad - it's just something I don't get. It seems more like something someone would post on a message board (i.e., fan theorizing) rather than a story. 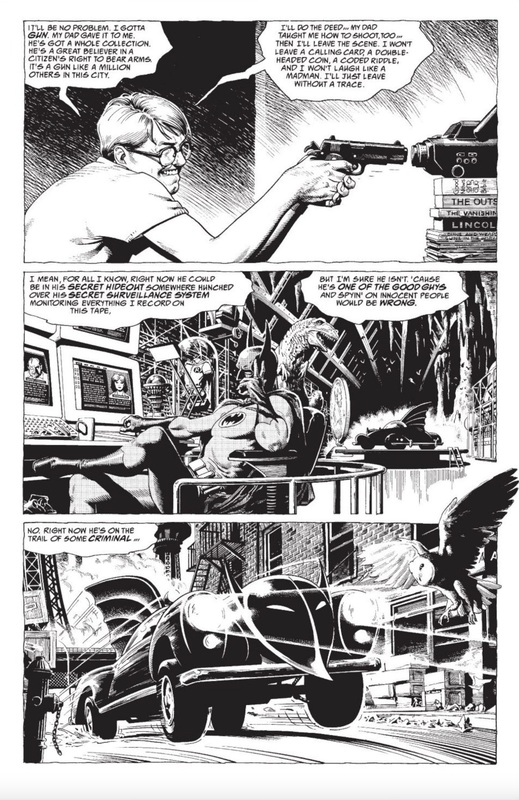 "I'm not sure what it's supposed to be except a way of Bolland to showcase his art." 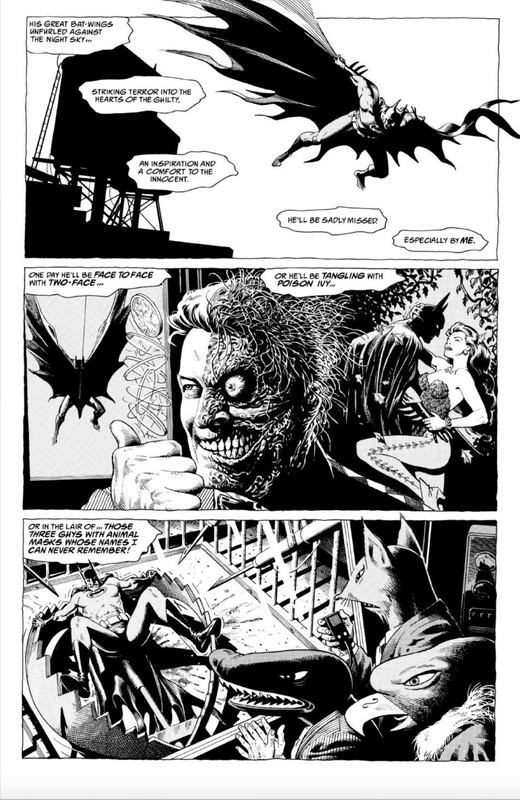 Sort of, he admits in the introduction that he wanted showcase some characters and scenes he wasn't able to draw in 'The Killing Joke'. After applying a sufficiently large dollop of fanwank, I think it... might be a metaphor for writing or the nature of fiction or something? 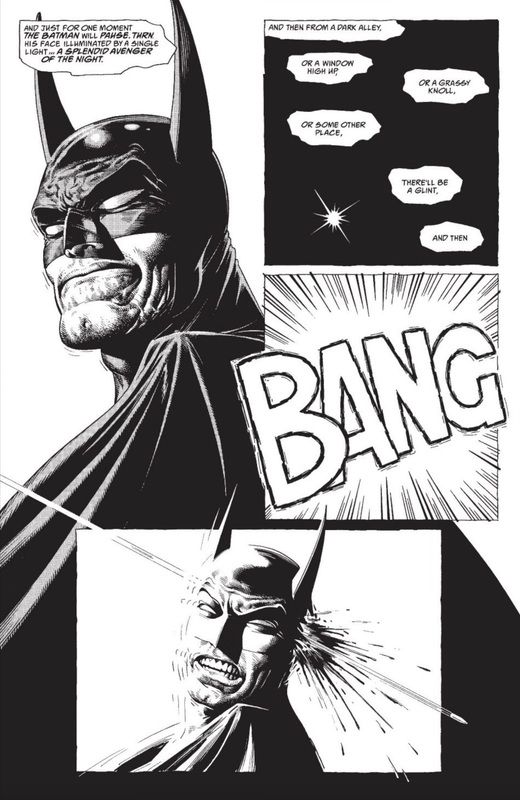 Note that the Innocent Guy and Batman are never seen sharing a scene or even a panel, and are drawn (... I think) in deliberately different styles. Conclusion - the Innocent Guy is (or thinks of himself as) a writer, testing out different ways to get people to pay attention to his story. He considers the classic fridging (his wife) and the "kill off a real-life celeb" (the Pope) routes, before settling on "kill the hero (even though he'll probably be back in three months)". Not sure I get the classic fridging bit since he mentions that it would be a random little girl, not his wife, well not his wife yet, he's too young,. I actually sort of like this story, leading a blameless life without guilt IS the best way to stay under Batman's radar until you're ready. It's not a villain with a master plan just a man with an idea. Yeah. First, it's unlikely he'd succeed at picking Batman off unless he knew not merely how to shoot, but how to snipe. Second, even if he did succeed, he's a fool to believe he'd never get caught just because he was unknown to the forces of law and order and acted stealthily. If Batman were found murdered, the superhero community both within and outside of Gotham would immediately investigate to the fullest extent of their abilities. That would include not only those who are skilled detectives themselves (some of them whom Batman himself trained), but those with a command of magical and paranormal methods for uncovering what forensics can't. 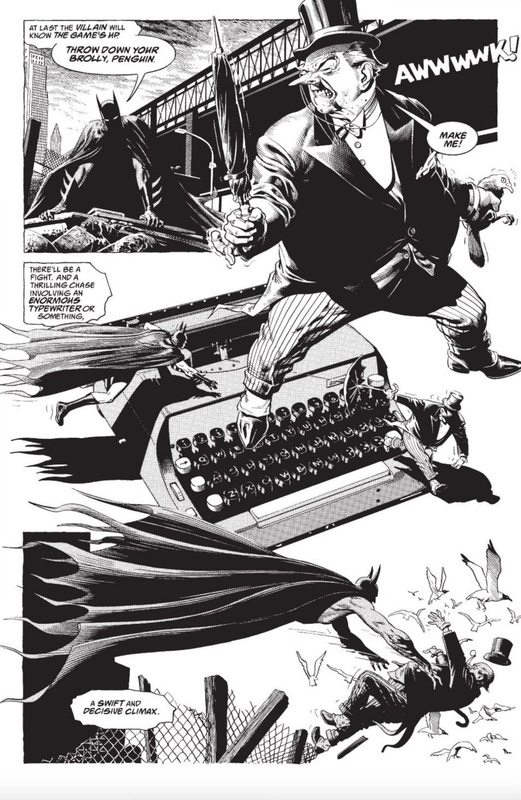 Even those who'd been on the outs with Batman would put aside their grudges when one of their own was downed, and would pitch in however they could. The superhero community would find the culprit. And Heaven help him if the Joker (especially the more-or-less god-mode Joker so favoured by today's writers) were to find him first. While this is all true, I don't think it really applies because the Batman: Black & White stories were not in any kind of continuity. They were about the platonic concept of Batman, not Batman as he exists in the weird shared universe that's arisen through quirks of the comic publishing biz's history called the DCU. Fair enough. 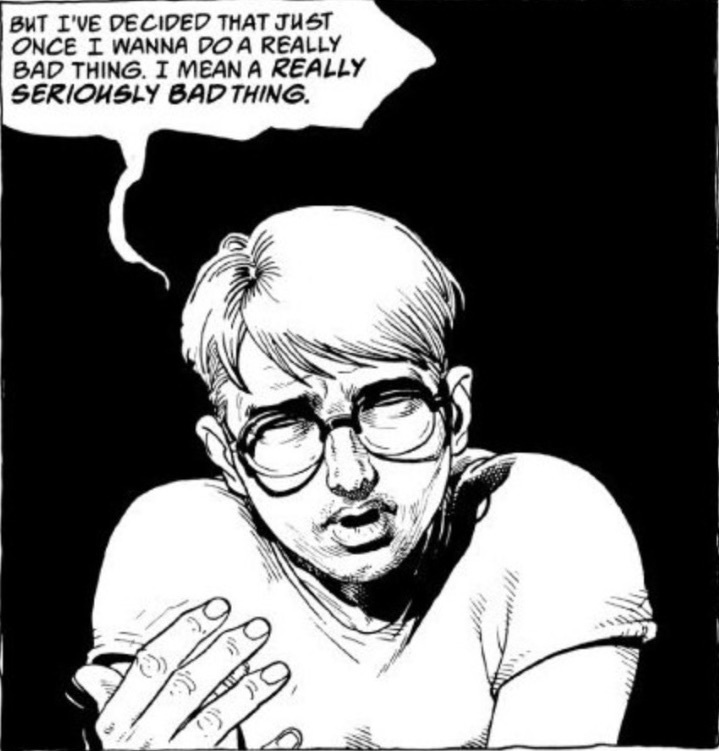 This was after all a series featuring stories like the one in which Bruce loses his mind and develops a third identity, one which (it was implied at story's end) had no qualms about taking a criminal's life. Obviously that wouldn't do for ongoing DCU continuty. He's already recording a tape for no damn reason. Animal masks can't be that far off. this guy would make hte average Marvel citizen say "dude, going a tad far, ain't yah?"